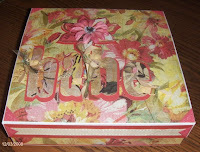 I had a little time yesterday afternoon, so I sat down to create this Memory Box. It was so much fun! I used the Close To My Heart My Creations Memory Keeper Box, and I think that is the nicest one in the industry to cover. It starts out flat, so you can work with it that way until you are ready to pop it up. The lovely papers I used are from the Basic Grey line - Stella Ruby. The Creme Brulee ribbon and various embellisments are also from Close To My Heart. I had a blast cutting out those letters! If you haven't seen a Slice yet, stop at your local scrapbooking store to see a demonstration. It is so small and made by Making Memories. It's quick, easy, and takes up no space. I LOVE my husband even more (if that's possible) for surprising me with one!